Hundreds of pagans and druids descend on Stonehenge to celebrate the Autumn Equinox. Despite the poor weather conditions visitors headed to the famous 5,000-year-old stone circle in Wiltshire in the dark to ensure they got to see the sun rise. And they made the most of one of only four public annual events that allows people to get so close to the stones. 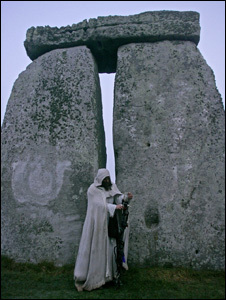 WHY CAN PAGANS AND DRUIDS GET SO CLOSE TO THE STONES FOR THE EQUINOX? The famous Stonehenge circle is normally roped off to the public, but special access is granted four times a year. This is only on the mornings of the summer solstice, winter solstice, spring equinox and autumn equinox. English Heritage has ‘managed open access’, meaning the public can stand among the stones on these days. Anyone can turn up on the day to get close to the stones, but people are asked not to touch or climb on them. Organisers also have a ban on bringing glass bottles or pets onto the site and on playing amplified music. Today Stonehenge was opened at 6.15am when it was deemed light enough to safely allow people into the field. English Heritage are expected to offer a short period of access, from first light or safe enough to enter the monument field (approximately 06.30am) until 08:30am on the 23rd September this year. Mabon is a harvest festival, the second of three, that encourages pagans to “reap what they sow,” both literally and figuratively. It is the time when night and day stand equal in duration; thus is it a time to express gratitude, complete projects and honor a moment of balance. The equinox is when day and night are actually the same length. It happens several days before the spring equinox, and a few days after the autumn one. The reason day and night are only almost equal on the equinox is because the sun looks like a disk in the sky, so the top half rises above the horizon before the centre, according to the Met Office. The Earth’s atmosphere also refracts the sunlight, so it seems to rise before its centre reaches the horizon. This causes the sun to provide more daylight than many people might expect, offering 12 hours and 10 minutes on the equinox. The word ‘equinox’ itself actually mean ‘equal’ (equi) and ‘night’ (nox). Hundreds of pagans and druids descended on Stonehenge on the 23rd September to celebrate the equinox as autumn began. Visitors headed to the famous 5,000-year-old site in Wiltshire in the dark to ensure they got to see the sun rise. And they made the most of one of only four public annual events that allows people to get so close to the stones. Photographs showed attendees singing and wearing a variety of extravagant outfits as onlookers watched on. It is the time of the autumn equinox, and the harvest is winding down. The fields are nearly empty, because the crops have been plucked and stored for the coming winter. Mabon is the mid-harvest festival, and it is when we take a few moments to honor the changing seasons, and celebrate the second harvest. On or around September 21st, for many Pagan and Wiccan traditions it is a time of giving thanks for the things we have, whether it is abundant crops or other blessings. It’s a time of plenty, of gratitude, and of sharing our abundance with those less fortunate. Stonehenge is a world renowned historic Monument and part of a World Heritage Site. It is seen by many who attend as a sacred place. Please respect it and please respect each other. Do not climb or stand on any of the stones – this includes the stones that have fallen. This is in the interest of personal safety, the protection of this special site and respect for those attending. As well as putting the stones themselves at risk, climbing on them can damage the delicate lichens. … but some people seem happy to ignore these requests. I’m going to take a little time to explain that, strange as it may seem, the monument is actually quite delicate and damage to it does occur. In 1953 during an archaeological investigation a set of carvings were noticed on the inner face of one of the stones of the central trilithons (Stone 53, to be precise). These carvings weren’t the usual graffiti that’ve been incised into many of the stones over the last 200 years or so – people’s names, initials, dates and so on. They were in fact very ancient indeed, dating back to the middle Bronze Age around 1700BC and were of bronze axe heads and a dagger. The ancient carvings are noticeably “softer” around the edges in the modern shot and this is largely due to the action of people’s fingers tracing their outlines over the course of the last 63 years. Sarsen may be hard, but it’s still a sandstone. Some bluestones exist only as stumps and many are fallen. These get trampled over by thousands of feet at the solstices and equinoxes, and many have acquired a polish as a result. One of two examples of bluestone are so soft that they crumble away at a touch and these have eroded down to stumps that barely break the surface of the ground. It’s been a while since tourists were rented hammers by the local blacksmith so they could take souvenirs, but it’s not unknown even in modern times for people to try it. Although deliberate damage is rare, it does happen. At the 2014 Summer Solstice, someone thought it’d be a good idea to start writing the date (in US format – 6.21.14) in letters about 3” high, using a marker pen, near the bottom of Stone 3. This damage is permanent. The ink has been carried deep into the stone surface and the conservators have been unable to remove it. At the winter solstice that year, another bright spark decided to annoint the sides of about a dozen stones with some kind of oil, leaving dark streaks over 18” long that will take decades to fade. If you’re going to annoint the stones with anything, then use pure spring water and not some nasty goo you’ve bought off eBay. Thoughtless damage happens every year – candlewax from spilt tealights, rubbings with crayon that goes through the paper, forcing random items like crystals or coins into crevices, digging in the ground and even trying to light a fire on a stone. Disrespectful damage – vomiting, urinating or even defecating on the stones – is less common but also occurs. It’s hard to imagine the kind of person who thinks that sort of behaviour is acceptable anywhere, let alone at our most famous ancient monument. While standing on the stones is bad enough, climbing up them is far worse. The fuzzy grey-green lichen that coats the upper reaches of most of the sarsen stones is a species called Sea Ivory (Ramalina Siliquosa) and usually only grows on marine cliffs, particularly in southwest England and Wales. It’s very easily knocked off by people brushing against the stones and large areas are destroyed by someone sliding back down having scaled any of the uprights. There are at least 9 marine cliff species of lichen present, and how they ended up 50km from the sea is something of a mystery. The last major study of the Stonehenge lichens was carried out in 2003. It found 77 different species, including two that are found in a particular recess of one specific stone and nowhere else on site, and another that only grows on one single stone at Stonehenge and nowhere else in southern England. So the next time you decide to come along to an Open Access Equinox or Solstice Dawn, please be one of the people who understands how fragile the monument is and who treats it with respect. Tell your friends too and – even better – if you find any litter that other people have dropped, please pick it up and put it in one of the bins. Please share this article on social media and help raise awareness. If you are considering visiting Stonehenge for the Solstice or Equinox celebrations you can join an organised tour. Use a reputable tour operator who respect the conditions. Stonehenge Guided Tours are the longest established company and Solstice Events offer small group Solstice tours using only local expert guides. Even kings have problems with councils, it seems. Arthur Pendragon, the self-titled druid king of Britain and who says he’s the reincarnation of King Arthur, is suing over a parking charge at Stonehenge. He’s also taking action against a police force and English Heritage over the £15 fee. King Arthur believes the charge is ‘illegal’ for worshippers to the stones for the summer solstice, dubbing ‘pay to pray’. The charge was introduced for this year’s event on June 21, which saw 12,000 people flock to Stonehenge, in Salisbury, Wiltshire, to mark the longest day of the year. When Mr Pendragon refused to fork out – saying the £15 fee is ‘grossly unfair’ as it is three times what tourists pay on any other day of the year – he was barred from the UNESCO World Heritage site. The 62-year-old, who rides a motorbike, decided to take action against the ‘money-grabbing’ authorities because it breaches his human rights. Mr Pendragon – an ex-soldier and biker gang leader who was born John Timothy Rothwell to parents May and Wilfred – said he will do ‘whatever it takes’ to win. Who is the modern-day King Arthur? Mr Pendragon is an English eco-campaigner and Neo-Druid leader of the Loyal Arthurian Warband, who believes he is the reincarnation of King Arthur. He rose to fame in the 90s when he won a case at the European Court of Human Rights to allow open access to Stonehenge for religious festivals. He said: ‘If you go to Stonehenge as a tourist today you will pay £5, but if you go there on the solstice as a pilgrim they make you pay ££15. English Heritage has previously stated that it needs to charge the fee as £60,000 is spent on parking facilities during summer solstice. He said: ‘It is all about money. Stonehenge is getting 1.3 million tourists a year – it is English Heritage’s biggest cash cow. English Heritage are expected to offer short period of access, from first light or safe enough to enter the monument field (approximately 06.30am) until 08:30am.